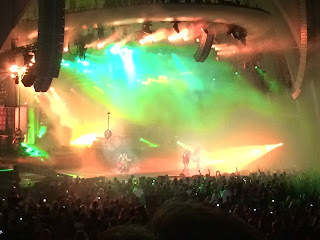 In high school I was never into Motley Crue, and did not understand Alice Cooper at all. But over time I have started to appreciate them more, and when I saw that the Crue was on their “final tour” with Mr. Cooper opening up for them, I had to get tickets. 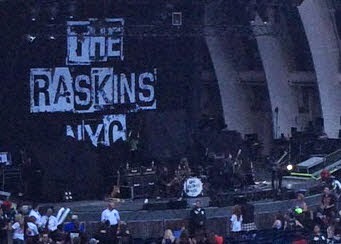 I was able to see them this past Monday night at the Hollywood bowl, and it was just about what I expected. The Hollywood Bowl is Los Angeles at its finest, and it is usually a good place to see a show. The acoustics are good, and since it is in an urban area they keep the volume in check. There was a nice vibe this evening, and a lot of energy in the air which is why this is usually my favorite Southern California outdoor concert venue. The audience was a strange mix, and quite a bit more diverse than I figured it would be. For a change, I got the $6 express bus ride from Lakewood, which turned out to be stress free and saved me from having my trusty Toyota trapped in the Bowl’s $23 stacked parking lots. It worked out really well, and I recommend this to anyone who is heading to a show there. 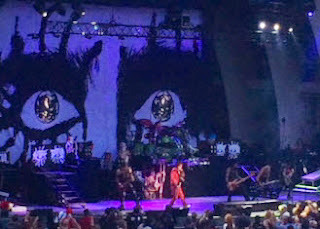 It took about 20 minutes to get their crap off the stage, and Alice Cooper hit the stage for his 50 minute set right as it was getting dark. He puts on a really fun show! There was plenty of schtick and oodles of props that he used as he played through all of the expected favorites (“School’s Out”, “Poison”, “Feed my Frankenstein”, “Welcome to my Nightmare”). With his growly and low style of singing he has not blown his vocal cords out, and he proved to still be a prime entertainer, which almost makes his guillotine act, the 12-foot monster and the fake blood kind of unnecessary. But it would not be the same without this stuff, would it? His band was in good form too, though three guitarists might be a bit too much, and for a show this short I could have done without the bass and drum solos. Special props go out to guitarist Nita Strauss, who brought her A game to the show! After Cooper’s set, it took more than a half hour to complete an epic stage re-set before Motley Crue could take the stage. And they hit it big, with an abundance of explosions and fireballs during the opener, “Saints of Los Angeles.” The sound was terrible and it took a minute or so for me to even figure out which song they were playing. Unfortunately the sound did not get any better over their 90 minute set. Vince Neil is looking old and weird, and his outfit with its knee-length sleeveless coat looked like something my mother would wear. He uttered a truckload of F-bombs throughout the evening, certainly no longer has the voice to do a full-length rock show. So, he relied on the age-old standby of singing a few lines and then holding the microphone out so the audience could sing the choruses for him. He used this crutch a lot as the evening went on, but the fans didn’t seem to mind as they knew the words to every song. Maybe after this “final tour” he can focus on his strengths, such as killing drummers, driving under the influence and beating on women. The rest of the band did well. Guitarist Mick Mars looked like he was in terrible pain that night, and he probably was as his health issues are taking their toll. He was never the most blazing artist, but he turned in a solid performance on this evening. Nikki Sixx and Tommy Lee are still stars, and their backline was rock-solid. Of course Tommy gave the fans a hell of a drum solo, and proved that he is still the most talented guy in the band. Don’t get me wrong, Neil was not good and the sound was terrible, but it was still a fun evening. You cannot go wrong with dancing girls, catchy (but sadly misogynistic) tunes, heavy drums, fireworks and a guitar that becomes a flamethrower. Due to Mar’s health issues, this probably will be their last tour so if you ever wanted to see Motley Crue, now is the time. Having Alice Cooper on the bill will make the evening complete, so check them out if you get the chance. Today we are looking at a 2006 Martin D-15 Custom dreadnaught acoustic guitar. This model is on the lower end of the Martin spectrum, but is still a pretty nice US-made guitar. The custom part is that this instrument have a spruce top and rosewood sides and back, unlike other Martin D-15 guitars that are made of solid mahogany. These were only made for a few years and were distributed exclusively through Musician’s Friend. Indeed it is made of some nice woods! It has a mahogany neck, Sitka spruce top, and East Indian rosewood sides and back. The bridge is made of East Indian rosewood too. I am not sure where the fretboard came from, but it is rosewood too. Inside there is D1 A-frame bracing, if you have any idea what that means. Ornamentation is sparse -- the body has a matte finish, a simple rosette and body binding, and a nice-looking faux tortoiseshell pickguard. Unfortunately, it looks kind of cheap if you think about it too much. The neck is pretty sweet. It has a smooth oval profile, and has a glossy finish. It has the traditional 25 1/2-inch scale 1 11/16-inch width nut. 14 of the 20 frets are clear of the body, and they are well-finished and pretty level. The neck is capped by a rosewood headstock overlay, a gold foil logo, and nice quality chromed sealed-back tuners. This one is in pretty good shape on its 8th birthday. It just has a few marks, dings, and nicks, and the matte finish has been worn shiny in a few places. The frets are still in great shape, and it sets up nicely with a very low action on light gauge strings. Somewhere along the line someone professionally installed a bone nut, which is not a bad thing. It weighs in at around 4 pounds, 6 ounces in case you are keeping track. How does it work? Despite its entry-level cost it has a definite Martin character and tone. The dreadnaught body style allows for sufficient power, and the low oval profile neck is fast and easy to handle. The bass is loud and full, and the midrange detail is sweet with a good balance between the two. It is fun to play, and is nice for songwriting, fingerpicking, folk, country and bluegrass. Don’t get me wrong – it is not in the same league as my D-18GE, but it is pretty darned good. I guess the important thing is how much these things cost. Back when they were new, they had a list price of $1499, and a street price of $999, which included a nice-quality hardshell case. These days they are $500 to $600 used guitars, which is not too bad for a US-made Martin that is built with nice woods. Plus, they have all been getting older and the tops have been loosening up, so they sound better than ever. There was a bit of mystery when Musical Theatre West announced its 2013-2014 season, as one of the shows had still not been announced when I bought my presale season tickets. It turns out that MTW was in negotiations to get the rights to produce Beauty and the Beast, and that Disney was reluctant to have the show playing a mere 13 miles from Disneyland. Apparently they worked out their differences, as Beauty and the Beast is the final show of the season, and I had the opportunity to see it this past Sunday. 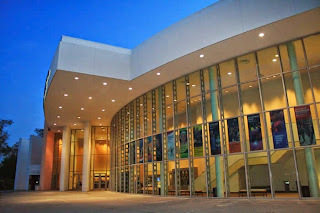 Musical Theatre West has been around since 1952, when it started out as the Whittier Civic Light Opera. Their productions evolved over time, and they went from being an all-volunteer operation to producing full seasons, currently under the capable leadership and vision of Executive Director/produce Paul Garman. 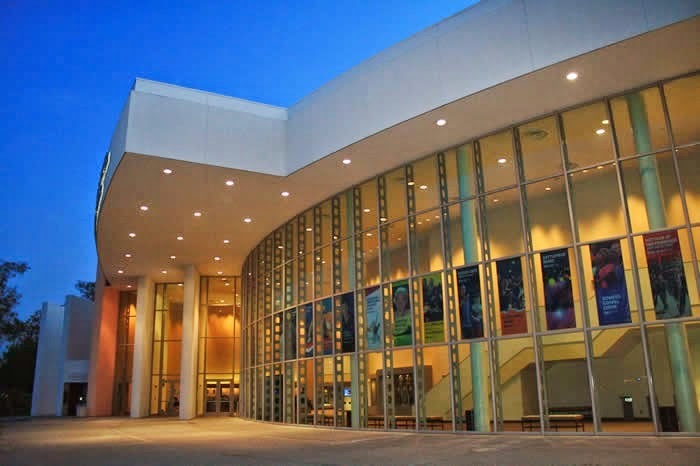 Their big shows are hosted by the Richard and Karen Carpenter Performing Arts Center at Cal State Long Beach, which is a lovely venue with plenty of conveniently located parking. If you have kids under the age of 30 (or if you are under 30) you have probably seen Disney’s full-length animated movie from 1991, Beauty and the Beast. It is a neat movie full of catchy tunes, and it earned a passel of awards that year, including Oscars (it was up for Best Picture but did not win), Grammys and even a Golden Globe for Best Picture. Somebody go the bright idea to turn it into a stage musical, and it premiered on Broadway in 1994. Its run lasted 13 years with over 5400 performances, and it is pretty much a classic show at this point. There is a good reason for this, as it is a neat story that is accompanied by very good music and lyrics. Of course the story loosely follows the old French fairy tale, but it was certainly churched up by music from Alan Menken (8 Oscars, 11 Grammys, 7 Golden Globes and a Tony), lyrics by Howard Ashman (2 Oscars and a Golden Globe) and Tim Rice (3 Oscars, 1 Grammys, and 3 Golden Globes), and a book by Long Beach’s own Linda Woolverton. 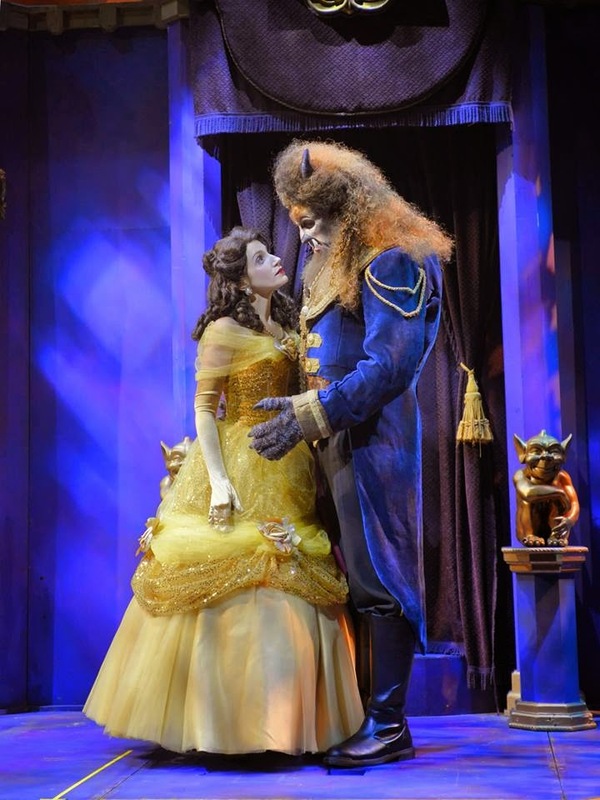 These folks have had a hand in most every Disney musical that has come out over the past 20 years, as well as many of the most popular stage musicals, and they brought their A-game for Beauty and the Beast. The basic plot is that a prince is turned into a beast due to his wicked ways, and everybody in his castle is turned into ordinary household objects. Along the way he kidnaps a spunky young woman named Belle and holds her in his castle. To regain his human form he has to somehow get Belle to fall in love with him. It could happen. By the way, if you are a fan of the movie you will notice that there are seven new songs that were written for the stage musical. The Broadway version is a tough act to follow, as its sets and costumes were over-the-top and magnificent. Musical Theatre West rose to the challenge, and I have heard that this ended up being the most costly production they have ever done. They got the look right. The rented sets were nice, though some of the backdrops were a bit wrinkly, and there were a few miscues where hanging elements were moved at the wrong time and then hurriedly put back into place. MTW regular Jean-Yves Tessier took care of the lighting, and he certainly seems to have his job figured out – everything was lit perfectly. 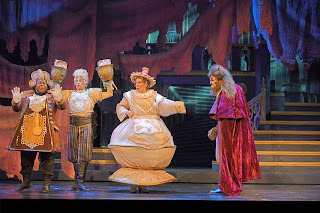 The costumes (from Musical Theatre of Wichita, supposedly) are top shelf and were assembled under the supervision of Tiia Torchia and Shawn Adrian Decou. Of course Beast had to have incredible make-up, and Denice Paxton did good work there. 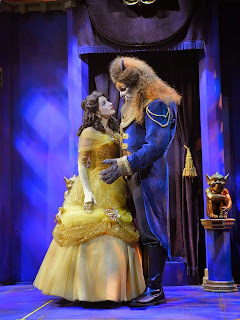 He was actually more attractive as the Beast than as the Prince, if that makes any sense. The sound was also very good. There was a 17-piece orchestra under the supervision of musical director Michael Borth, and I counted three keyboard players in the pit, which certainly helped with setting the mood. Unfortunately the musicians were uncredited in the program, and I have no idea if they were union or not. The sound engineering was generally good, with a few hitches along the way. Cogsworth had a wonky wireless transmitter that added a lot of noise to the mix (this was fixed after the intermission), and there were a few incidents where a ton of reverb was left in the signal chain for ordinary speaking parts which was distracting, at best. All of the basic foundation was solid, but this is such a well-written show that its success hinges on the cast, and the performers (mostly equity) all delivered solid performances. Gwen Hollander earned the role of Belle (the Beauty) and rightly so. Her voice was beautiful and her timing and acting were impeccable. She has grace on the stage, belying her Broadway and touring experience, and it certainly did not hurt that she had played Belle previously. Garrett Marshall played the Beast, and he rose above the limitations of having his face shrouded for most of the show. He has a strong singing and acting voice, and was able to portray emotion through his body language well. Both he and Christian Marriner (Gaston) have strong stage presence, which made it all the more obvious that this show had the typical Disney trait that male roles are favored. They got all of the good lines, and often times the Belle’s character was secondary and relied on the males in her life to make her complete. 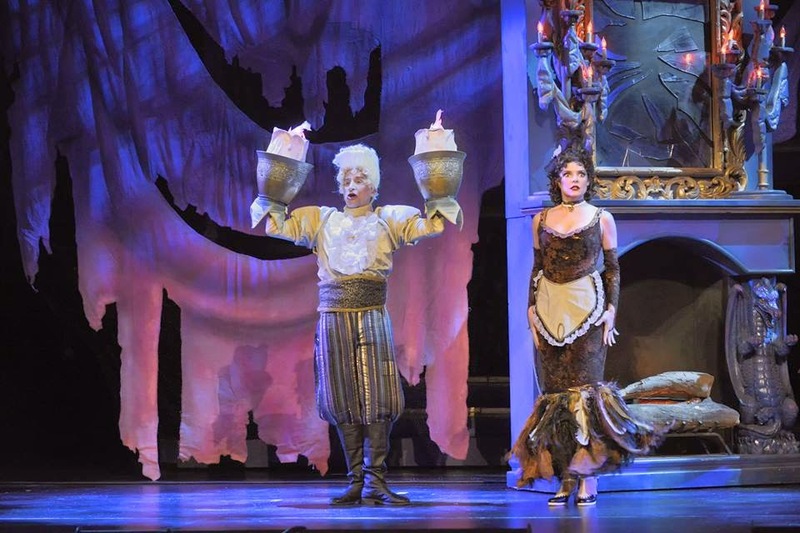 The supporting cast was wonderful, with Brandon Armstrong as Cogsworth, Melina Komas as Babette, Doug Carfrae as Maurice and Robert Ramirez as Lefou. 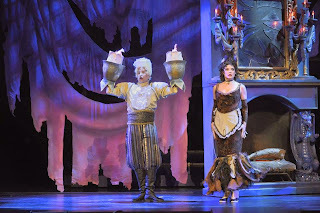 The standout performances were Michael Paternostro’s take on Lumiere and Cathy Newman as Mrs. Potts. Their acting and singing were fantastic, and they almost stole the show. The ensemble turned in a solid performance, and they were very good dancers (especially the young man that played the bottle opener), and they made good use of Bill Burns’ choreography. Their vocals were well-timed and sounded good, with the exception of some drastic volume differences between them which became distracting on some of the bigger numbers. I loved the Silly Girls and that they used monsters / dancers to help move set elements on and off the stage. All of this came together well for an almost Broadway-like experience. Musical Theatre West has outdone itself and Beauty and the beast is a good show with fine production values and a good cast, with a little something for everyone -- excitement for the kids and romance for the adults. If you have the chance you should get out and see it before it is gone, but leave the little kids at home with a sitter. This is a long show and they will be squirming in their seats a long time before the final curtain falls (it clocks in at 2 ½ hours, including the 15 minute intermission). Beauty and the Beast will be playing at the Carpenter Center through July 27, and it has been a good seller for Musical Theatre West. There are still a few tickets left, so grab them while you can. 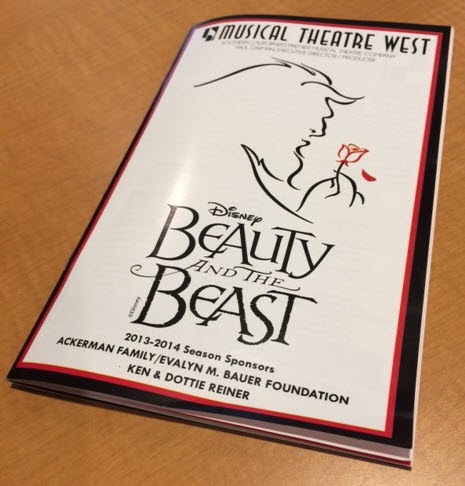 And, be sure to check out their season ticket packages for the 2014-2015 season as they have a great package that includes Big Fish, South Pacific, Les Miserables and Singin’ in the Rain. You can’t beat the value! If you are going to do an album with no lyrics, you had better make sure that your songwriting and performance skills are in tip-top shape. With nothing to distract the listener, they will hang upon every last note you play, and be critical of any missteps. Well the Chris Winters band does not have to worry about this as they accomplished this task handily with their latest instrumental release, Blue Fever. Chris Winters has been in the Chicago blues scene for years, recording, playing and touring with some excellent folks, including Mississippi Heat and Otis Clay as well as a regular gig with Liz Mandeville Green. His impressive guitar chops have kept him working steadily for years. Winters is inspired by Freddie “The Texas Cannonball” King, and his love of 1950s and 1060s guitar instrumentals has culminated in the production of this album. Winters is joined on this CD by a passel of other great musicians. He takes care of the guitars, with Steve “The Kid” Howard on bass, Brother John Kattke on Hammond organ, while Kenny “Beady Eyes” Smith and Larry Beers share the drumming chores. By the way, Kenny Smith is the son of the late Willie “Big Eyes” Smith, the legendary drummer and harp master. Blue Fever is a great follow-up to his last instrumental release from 2004, Impressions. Like before, he did not fall into the trap that is found on some instrumental albums where it ends up being a series of self-indulgent jams that go on forever. Instead, he focused on the songs, and all eleven tracks tell a musical story with the longest clocking in just a bit over five minutes. 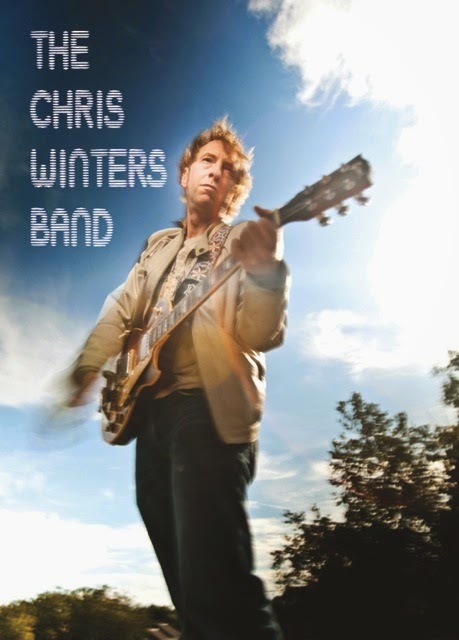 And Chris does not get stuck in a rut either, as he moved away from the more jazzy material of his previous release and recorded tunes that cross a number of blues genres. The opener is the upbeat “One a Day Blues” which has a traditional 12-bar blues structure, some nice organ work, and a glorious 1950s throaty guitar tone. He has a fabulous touch on the guitar and his lyrical playing style ensures that the listener will not bemoan the lack of words. Then the band explores funk with “Freedom Cry” which is nice and with the solid backline of Beers and Howard. Kattke’s keyboards do a nice job of filling the gaps and setting the mood as Winters doubles up on his guitar parts. “Space Boogie” (not a remake of the Jeff Beck song of the same name) is a fast Texas-style boogie, and Chris gets the chance to show off a little with searing guitar solos as Smith hammers out the rock solid drum line. Things slow down for “Low Tide” which is a laid-back blues tune with more simple bass and drum parts so the guitar can tell the story. After this breather, there is plenty of fancy picking in “Blue Country Rag,” which sounds just like you would expect from the title. There is a definite Albert Lee twang and vibe to this one, which is a good thing in my book. The title track reminds me of the great melodic blues guitar players, such as Gary Moore or Peter Green. The rich organ sounds and the heavy ride cymbal and snare would fit in well with the best of the early 1970s blues rock releases. This is my favorite track on the album, and this is one where I wish Winters would have taken a few liberties and made it even longer. Five minutes was just not enough for this song. “Dealing with a Feeling” is a slow and short, but still melodic, and Chris does a fine job of giving his guitar a voice and telling a story without words. 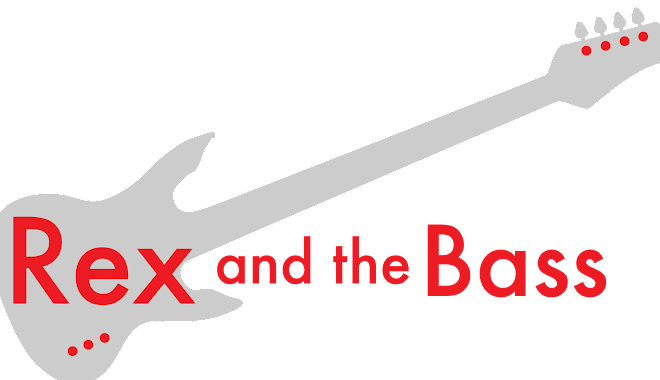 They also rock out a bit with “Did You Know” which is a harder blues rock tune with a nicely doubled bass line and a raw electric guitar tone. After the jaunty swing of “Staring at the Sun, the Chris Winters Band finishes up the effort with “Breaking the Chains.” This funky blues rocker ties together a lot of the genres found in this album, and leaves the listener wanting more. They did not wear out their welcome, which shows a lot of maturity on their part. Overall, the production is consistently good, and the instruments are recorded well with even tone and all of the tracks have a solid mix. Blue Fever is a fine album, and if you like blues-based guitar instrumentals you have to check it out for yourself. Chris Winters did a great job, and I hope we do not have to wait another nine years to hear more from him. A while back I picked up a Musicman Stingray 4-string bass that some misguided soul decided to put enormous strings on in an effort to make it sound like the lower 4 strings of a 5-string bass. It was a stupid cheap deal, so I bought it to flip. Funny enough, his idea actually worked, but that was not what I was looking for and it would be harder to sell it this way so it was time to string it normally. Unfortunately the nut slots were opened up a bit to accommodate the bottom heavy (0.130 for the B!) strings, and it was a compensated nut which would have been a headache to buy. So, I started looking for the best compromise, which ended up being a set of Ernie Ball Power Slinky bass strings (model number P02831). If you have not been living in a cave for the past 50 years, you have heard of Ernie Ball strings. Mr. Ball was an innovator that came up with the idea of mass-marketing custom gauge strings and he built the business into one of the biggest string manufacturers in the word. That is what happens when you listen to your customers and give them what they need. His son and grandsons now run the company, and the strings are made right here in the US by people that earn a living wage. A few years ago I had the opportunity to tour the factory (near Palm Springs) and it is an impressive organization. Anyway, I eagerly tore open my new foil pack of Slinkys, trimmed them to length and used my Ernie Ball Powerpeg string winder to cinch them up. They seemed to fill the nut slots enough, and after a bit of fussing with the truss rod I got the action to a reasonable height. After a bit of playing it was apparent that this was a good plan as it played just fine. In fact, it was kind of a big macho thrill. I could wail and pop and slap on this 'Ray and there was no untoward buzzing or clanking. There was a good balance between the strings, and there is nothing on the planet like the zing of a fresh set of roundwound. Of course, these string were not made to salvage dumbo situations like the one I was in -- these strings are stout enough to maintain decent tension when de-tuned, so I had to try that out too. They are definitely able to meet this challenge, if that is your bag. 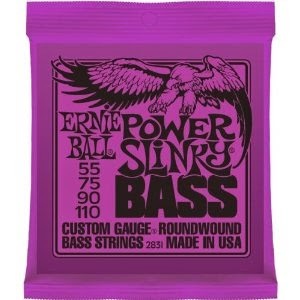 Ernie Ball Power Slinky bass strings are very good, and if you play de-tuned and/or are looking for more oomph, their heavier gauges could be just the ticket for you. It will not break the bank to find out either, as they are pretty reasonably priced. They have a list price of $36 and a street price of $17.49, and if you catch a lucky break with a sale or coupon you can get them even cheaper. How can you go wrong? Thanks for everything, Tommy, and rest in peace. My regular readers know I love vintage Japanese guitars and basses, and today we are looking at another one: a really neat Westone Thunder 1 bass from 1982. In case you are not up to speed on Westone, here is a quick run-down on the brand. Matsumoku was a Japanese company that specialized in making guitars for many brands, including Aria, Epiphone, Vox and more. They built very good instruments, including copies of popular American instruments that caused some legal difficulties. After building instruments for other companies for all of those years, in 1981 they decided to start their own brand and Westone was born. Their products were never a big hit and in 1987 Matsumoku sold the brand to a Korean company, and by 1991 the brand was gone. Not many of their guitars ere imported to the US, and it seems like most of their products went to the UK. The neck is a 3-piece maple laminate with an ash overlay on the headstock, and it attaches to the body with a 4-bolt joint and a Westone Made in Japan-marked plate. It has a rosewood fretboard with simple dot inlays, and the aforementioned 20 frets are pretty hefty wire. The tuners look like Westone-branded Gotohs, and there is a silkscreened Westone logo on the headstock. It is a 34-inch scale bass, in case you were wondering. As I said the body is laminated, and there is a control cavity routed in the back to hold the volume and tone pots. It has its own profile, with shorter horns than the usual Precision Bass, and there is a belly contour carved out of the back. The pickup and electronics are passive, no battery is needed, though it would be easy to add a pre-amp thanks to the easy-access back panel. This one has not led a pampered life, and there is a bit of finish wear and the logo is wearing off. The top strap pin has been relocated a few times, and does not appear to be original to the instrument. But it has good distance factor thanks to the clear finish, and it does not look too bad. The original frets are still in great shape and the pickup has plenty of output. And this Thunder 1 still plays well. It sounds just like a P-bass, and the action can be adjusted pretty low. The nut is 1 5/8” wide, so the Fender experience is there, though it does seem a little neck-heavy, thanks to that shorter top horn. Maybe that is why the pin was moved. It weighs in at 9 pounds, 12 ounces, which is not too bad if you consider that this thing is built like a tank. I like it a lot and the best part is that these basses are not very expensive – nice ones can be had for around $200. I would not sell this one that cheaply, for sure. There were other variations of the Thunder 1: instruments with black or red finish have solid maple bodies, and Thunder 1A basses came with active electronics. These variants are quite rare and I have not seen an unmolested one come up for sale in a long time. If you see one of these for a couple hundred bucks and it is still in good shape I say “buy it.” Trust me! A stage musical based on the 1990 Patrick Swayze / Demi Moore tearjerker “Ghost.” Whoever thought of this might have suggested it as a joke, but it kind of works. 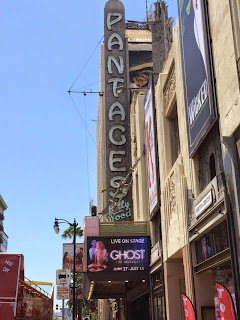 We checked out “Ghost the Musical” last weekend at the Pantages Theatre in Hollywood, California and it would have been ok if the production itself did not have major problems. The plot of the musical is pulled directly from the movie. If you saw it 24 years ago, you will probably be able to figure out what is going on. If not, you might want to pull it up on Netflix or read the Wikipedia entry ahead of time because it is hard to understand a lot of what is sung here (more on this later). Pretty much, Sam is betrayed by his best friend, Carl, and is killed in this unfortunate conspiracy. He has to use his spiritual form to save his distraught woman, Molly, from certain doom while acting as the hand of god by making the bad guys repay all of their karmic debt. This could be a wonderfully written show, with music by Dave Stewart (The Eurythmics) and Glen Ballard (yes, that Glen Ballard), and a book by Bruce Joel Rubin -- the music seemed fine, but the lyrics were tough to decipher. The show has changed little since it appeared first on Broadway a few years ago; it certainly is not Tony Award fodder, even though the original film somehow brought home a few Oscars and a half billion in box office sales. This 2014 version of Ghost is a touring production, and it is making stops throughout the United States. The creative staff have done a wonderful job, with veteran Matthew Warchus taking on the director role and Ashley Wallen doing a fine job with the choreography. Paul Kieve’s illusions, Jon Driscoll’s projections and Paul Weimer’s scenic designs were all first-rate, and were almost worth the price of admission. This fine crew used all of these pieces effectively and it should have been a very tight show. The leads were very good, as they were convincing actors and good singers (not to mention attractive). Steven Grant Douglas played Sam, Katie Postotnik was Molly, and Robby Haltiwanger got to be the dastardly Carl. But, Carla Stewart’s portrayal of Oda Mae, the reluctant psychic, stole the show. Almost 20 cast members were in the ensemble, and were the best part of the show for me. They were great singers and dancers, and a good chorus is the essential glue that holds a show together. Mathew Smedal directed the 11-piece orchestra that was mostly staffed with touring musicians, with a few locals thrown into the mix. Keyboards were used extensively to help make the mood in many of the scenes, and I think the orchestra did a fabulous job, with the exception of a drummer that could not control his volume. Ghost the Musical’s sets are first-rate, and were a little more complicated than most current musicals, and they were cleverly repurposed to achieve different effects and scenes. I especially liked the flyaway and swing effects. There are some very rough spots in Ghost, unfortunately. The sound was terrible, and it may have been the worst that I have ever heard. The drums were overpowering, and the rest of the orchestra’s mix was cranked to try to match their output to the point where it was physically painful and the vocals were drowned out. Even then, on the louder numbers all that could be made out from the orchestra was the drums. There was no way that anybody in the house could understand the subway ghost. The producers should be embarrassed, and I think that in the year 2014 they could have done a lot better than this. Also, many of the songs were sung with multiple melodies running concurrently, so that the lyrics were unintelligible, even on the softer songs that were not overpowered by the orchestra. These things were deal-breakers for what could have been a pretty good show, and I have to say, “don’t waste your time.” If you decide to check it out Ghost the Musical anyway, proceed at your own risk. It is playing in LA through July 13th, and will then be moving on to Costa Mesa and Las Vegas. I have been waiting for a new release from Dudley Taft ever since I heard his 2010 debut solo album, Left For Dead. Though he started solo work only a few years ago, this does not mean that he is just arriving at the party. This guitar master has paid his dues for over 30 years, and this musical journey has taken him to interesting places that give him a unique sound and vision. Dudley has lived all over the United States, growing up in the Midwest and attending prep school in Connecticut in the 1980s with none other than Trey Anastacio, who would later be in Phish. 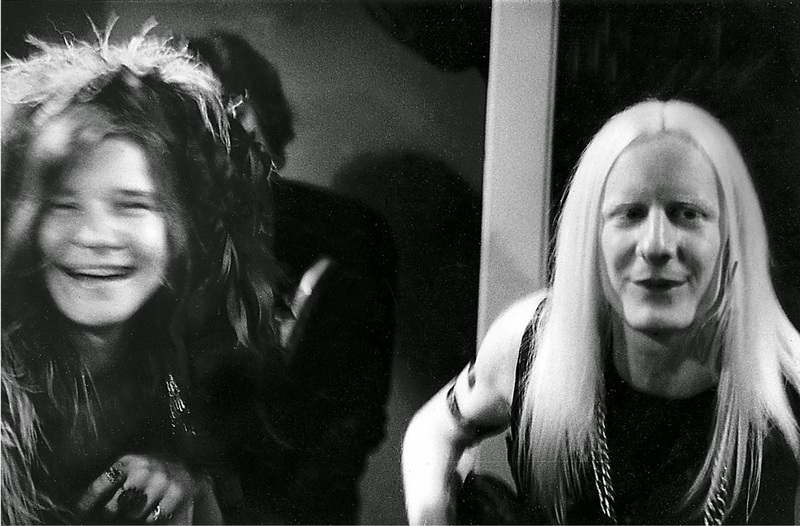 He moved on to Los Angeles to explore the hair band scene, and finally found his place after moving to Seattle in 1990. 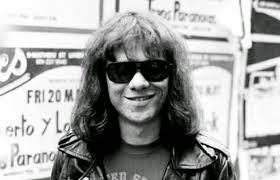 He became a fixture in the northwest, and spent twenty years there writing, recording, and performing his music with a few different bands. A few years ago he decided to form his own blues band after being inspired by Freddie “The Texas Cannonball” King, and he recently set up shop in Chapel Hill, North Carolina. Deep Deep Blue is Taft’s second solo release, and its eleven tracks include eight originals and three unexpected covers. Dudley wrote the original songs and handles the guitar work and vocals. He is joined by a capable band that includes Eric Robert on keyboards, Chris Leighton, Scott Vogel and Jason Patterson on drums, Ashley Christensen on backing vocals and John Kessler on the bass. Kessler also handled the production chores. Sticking close to his roots, this album was mostly recorded in Seattle, with overdubs and guitar tracks completed in North Carolina. Though he is inspired by classic blues artists, he does not copy what they did, but instead interprets it through a more modern blues rock context. “Meet Me in the Morning” is the opening track, and I must say that I have never heard of anyone covering this Bob Dylan song before. Thankfully he did not stick true to the original, instead turning it into a guitar-centered blues rocker with a solid riff. At its core this is a guitar album and it is refreshing that he is not aping anybody else’s tone or feel – he has spent years defining his own sound and it is to die for. Things really get rolling after this with the fast driving original rock tune, “The Waiting.” His lyrics mirror the guitar line and it is hard not to notice the rock solid backline. The bass and drums are perfectly in sync, so it is obvious that these are first-call musicians he is working with here. By the way, his voice has a raw and weathered tone that works perfectly with this harder-edged music. “God Forbid” is a southern rocker that showcases Taft’s deft songwriting skills, as its clever lyrics continue the story started in the title track Left for Dead. He also uses his writing skills to give a short history lesson in “Bandit Queen,” the story of Pearl hear, the stagecoach robber. I had to Google her after hearing this song to see what she was all about, and it is a fascinating story. Lou Reed’s “Sally Can’t Dance” is another neat cover choice and it includes some nice organ work, and as a Lou Reed fan I whole-heartedly approve of Dudley’s interpretation of this classic. It is upbeat and funky, and shows that these musicians can take on any genre that they choose. The final cover is a hard rock re-do of Freddie King’s “Palace of the King.” This version has a driving beat, screaming guitar work and well-done backing vocals. Taft can play the slow blues too, as he proves in the heartfelt “Deep Deep Blue.” Slowing him down does not lessen the tension that he is able to create with his guitar. He leaves no doubt that he is a fabulous musician and I get a Jeff Beck / Robin Trower vibe from him on this one. “Feeling Good Now” starts with a great hook, and then surprises the listener as a tight horn section pops in to double the guitar line. There is a little bit of everything in this album, but he never strays far from the guitar and once again he lights a fire in this funky track. This is followed up by my favorite song from Deep Deep Blue: “Wishing Well.” This country rock song starts with some very pretty acoustic work and makes liberal use of the backing vocalists during the verses and chorus. I like the way this tune swells and builds with electric guitars and then tapers off to finish acoustically. 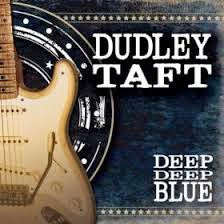 Deep Deep Blue is a fabulous effort from Dudley Taft, and it is notable that all of the tracks are solid and well-integrated with each other. It is apparent that he did not focus on writing a few hit singles, but instead worked to write a very good album. So, this is not a disc to cherry-pick tracks from, and it is better to listen to it as a whole so you can get the full experience. I really enjoyed it and look forward to hearing more from him soon! Somehow I have managed to make it this far through life without ever seeing Joseph and the Amazing Technicolor Dreamcoat, one of the more popular modern musicals. 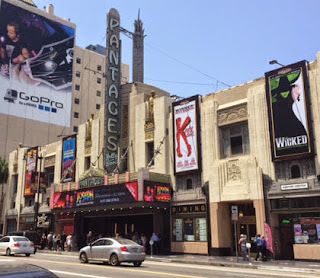 Well, I remedied this oversight last month at the Pantages Theatre in Hollywood, California. The Pantages has been a mainstay of Hollywood culture since it opened in 1930. It started as a vaudeville theatre, but it has hosted all manner of shows, operated as a movie theatre, and was even the home of the Academy Award Ceremonies for 10 years. Rumor has it that when Howard Hughes owned the theatre he had his offices on the second floor. Creepy. Anyway, the theatre had a $10 million renovation in 2000, and it is still in marvelous condition. For this show we had seats near the back of the orchestra section, and were able to see and hear everything well. It is a lovely place to see a show, with the added bonus of easy parking (for $10) and plentiful places to dine before or after the show. It is certainly worth the drive. The plot of Joseph is pulled straight out of the Old Testament of the Bible, and it is a bit complex; if you are not familiar with the story you might want to study up ahead of time so you do not get lost. It is the story of a young man who is given everything, but jealousy from his brothers results in him having to start over again at the lowest rungs of society and make his way back to the top through his inner fortitude and the grace of God. The events are full of treachery and forgiveness, and thousands of years later it is still mesmerizing, whether you believe in the Bible or not. This is a wonderfully written show, with music by Andrew Lloyd Webber and lyrics by Tim Rice, and it holds up well from when it was first appeared on Broadway in 1982. There is very little dialogue that is not sung, but the story still comes across loud and clear. Overall, the musical is very well-regarded, and it has won a trunkload of awards over the years. 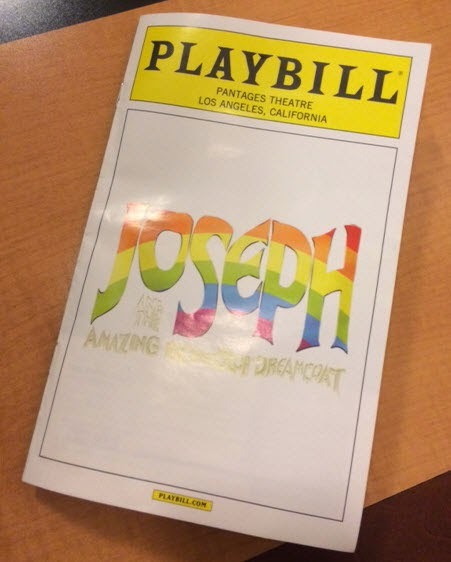 The 2014 version of Joseph is a touring production, and it is making stops throughout the United States. The creative staff have done a wonderful job, with Tony Award winner Andy Blankenbuehler taking on the director and choreographer roles. Beowulf Borritt (best name ever) took care of the scenic design, Howell Binkley designed the lighting, Jennifer Caprio coordinated the costumes, and Daniel Brodie handled the video and projection elements. This fine crew used all of these pieces and created a very tight show. Almost 20 cast members were in the ensemble, and they helped make the show for me. They were great singers and dancers, and a good chorus is the essential glue that holds a show together. The group numbers with the brothers were the highlight of the show for me. Wayne Green conducted the 14-piece orchestra that was mostly staffed with touring musicians, with a few locals thrown into the mix. Keyboards were used extensively to help make the mood in many of the scenes, and overall the orchestra did a fabulous job. There were no miscues or odd dynamics that drew away from the onstage action, which is just as it should be. Joseph’s sets are first-rate, and in current style are relatively simple and are repurposed to achieve different effects and scenes. I especially liked the effect of changing the aperture of the stage using the front curtains, as well as the projection elements. Things like this keep old musicals fresh. The lighting was well-done and cemented the mood for many of the scenes. Unfortunately the sound was muddy and poorly mixed at times, so I had some trouble focusing on and differentiating the music and vocals. In the year 2014 this is unacceptable – live sound equipment has come a long way. Unfortunately the leads were the weak link of this production, though both are popular American Idol alumni. Ace Young played Joseph, and the nicest thing I can say about him is that he is certainly a hunky dude that looks good with his shirt off. His dance moves were wooden, and much of the material was out of his vocal range and style. Eeek – this is not an easy role to fill! Young’s real-life wife, Diana DeGarmo took the narrator role which is the like tape that covers over significant holes in the story. She has lovely stage presence and vocal range galore, but most of what she sang was sharp to the point where everything was shrill and edgy. This could have been a problem with not being able to hear the orchestra (see above), and if so, shame on the sound guys. I am lukewarm on recommending this touring version of Joseph and the Amazing Technicolor Dreamcoat. Everything was great except for the sound and the major leads, which says a lot. If you have not seen the show before it might be worth your time just so you can see what all of the fuss is about. If you are a diehard fan I would let it slide until it comes around next time. If you just have to see it, Los Angeles was only the first stop, and the tour will be traveling all over the country until April 2105. Don’t say I didn’t warn you. Mahalo! In the first half of the 20th century, Epiphone was one of Gibson’s biggest competitors, so Gibson did the smart thing – they bought Epiphone in 1957. Gibson kept the brand name and started re-working the product line-up. In 1958 they introduced the thinline semi-hollowbody Sheraton electric guitar. The original Sheraton was a set-neck twin-pickup model that used the same body as the new Gibson ES models. The big differences were the “Frequensator” tailpiece, multi-ply body binding and lots of inlay work on the headstock and fretboard. The pickups on the originals were New York single-coils. As time went on there were specification changes, of course. In 1961 mini-humbucker pickups were swapped in and Grover tuners were added, and in 1962 the Epiphone “Trem-o-tone” tailpiece became available. In 1970 manufacturing was moved to Japan, and full-sized humbuckers became the new standard for the Sheraton. In 1986 the Sheraton II was launched, with a stop-bar tailpiece being the only real change. As time moved on, production moved to Korea, with minor spec changes here and there. So, the guitar I have was made in Korea in 2004, and it is finished in a very pretty Vintage Sunburst. It has a laminated maple body and top with a mahogany center lock (making it semi-hollowbody), and it is churched-up with 5-ply body binding. The neck is 5-ply maple and walnut (solid maple necks were used from 2008-on),and it has a normal 24.75-inch scale. The 12-inch radius fretboard is bound, and it has 22 medium-jumbo frets hammered into it, as well as v-block pearloid fret markers. The neck profile is a SlimTaper C with a 1.68-inch wide nut. The headstock is pretty darned big, also 5-ply bounds, and it has the traditional Epiphone vine of life inlay. Grover tuners are mounted to that headstock, and they are gold-plated, as are the Tune-o-matic bridge and the stopbar tailpiece. The rest of the hardware roundup includes a faux tortoiseshell pickguard (with a big E on it) and gold bell knobs. The past ten years have been kind to this Sheraton II. It obviously has been played a bit, but it has escaped heavy wear, and it just has a few light dings and no fret wear. The gold plated hardware has not fared as well, having worn through in spots, and it actually looks pretty poopy. When I hit the lotto I will have a solid gold bridge and tuners made for it. In the meantime, maybe I will track down some nickel parts for it and move on with my life. It is a bit heavier than expected, coming in at 7 pounds, 11 ounces, but it balances well on a strap so maybe that extra bulk prevents neck dive. It is a very easy playing guitar with a good action, and 10 years later the frets are better than anything that is coming out of Gibson’s Memphis factory. It has good sustain and can achieve a sweetly mellow jazz tone, or can get some bite going for rockabilly or early rock and roll. I like the Epiphone Sheraton II a lot – it looks good, plays well and sounds good, enough so that I feel that it is just as good as a Gibson ES-whatever for a whole lot less money. How much less? These things have a list price a list price of $1042.00 and a street price of $599.99 for the Vintage Sunburst model, which includes Epiphone’s lifetime limited warranty and Gibson’s 24/7/360 customer service. Or if you are really cheap, secondhand instruments can be had for around $400. Such a deal!